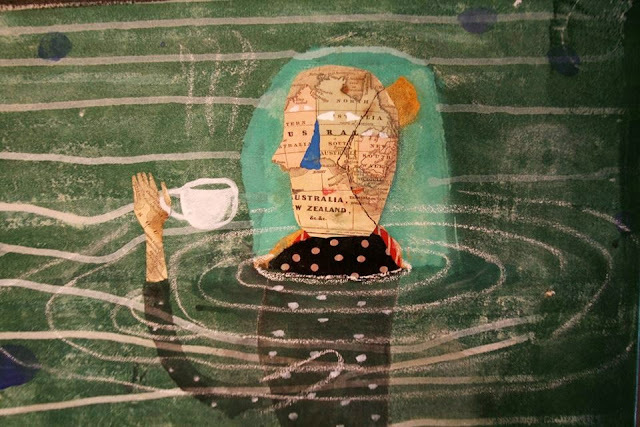 Donald Saaf's work for today, with this intriguing figure supping tea in a pond or a lake. Donald uses old papers collaged with painting and drawing to create his characters. Today is this blogs eighth Birthday but I cannot rest or celebrate, I have two deadlines; one accounts and another a competition, so I shall try to think myself into a warm pool with a cup of tea . . . calm thoughts. I love your blog! Congratulations on the 8 years!